I am curious about what methods the coaches used to get clients prior to having their SSC Certification. I am trying to accumulate coaching experience, and have been able to get a hefty chunk of my friends and family interested in training. The problem I found is that though my friends accompanied me to the gym to train, they really did so as a friendly courtesy and didn’t have any intentions of sticking to the program long term. I also train a handful of my friends online and spend a couple hours on the form check forums every day, but I am trying to get more in-person experience. I am now trying to find random people to train, but avenues like posting ads on Craigslist have not been very fruitful so far in gaining attention. Does anyone have effective strategies that attracted clients prior to having the certification? This is not a trivial question and I don't have a ready made answer for you. I can say that initially, you will have to be your own billboard. Make improvements, get stronger, and people may start asking you for advice. You live in LA, so you are surrounded by lots of people and lots of gyms. I am not sure what the best way to do this is, but there have to be some peeps nearby that would be interested in learning to lift for free or for a reduced cost. The best way to get new business is to present yourself as an actual business person and not just a guy who wants to coach some people to get experience. I don't suggest that you ever train people for free if you are trying to get people to stick with you for several months at a time. They need to have some skin in the game. You also need to learn to coach people that you don't already know and that don't know you. That's part of being a good coach. It's not just coaching form, it's also getting people to feel comfortable with you, earning their trust, and holding them accountable for their training. You need to be able to do this with people who aren't just family and friends. Set up a Facebook page and a website for your business. 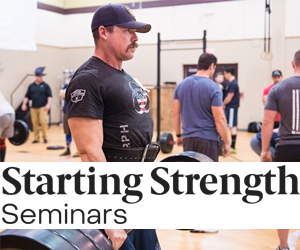 "Your Name Strength Training" is fine as a business name. Make sure your FB page directs traffic to your website and your website gives some basic info about you / your philosophy / and clearly directs them to contact you via email to set up an initial consult or training session. Start with daily FB posts that give away helpful information to your ideal client and boost those posts, targeted to the zip codes you want to target. Don't waste time on Craigslist. Where do you live? Small town? Suburb? Big City? My best set of 5 on the squat is 295 and my best set of 5 on the deadlift is 395. These are definitely not high enough to be garnering attention and be my own walking billboard, as Tom mentioned. I work with Paul Horn in LA and we are working on it, but I didn't want the weight of my lifts to hold me back while I accumulated coaching experience. @Andy - this is solid advice and I'm going to give it a whirl. I learned that charging people would be necessary, but I only realized that AFTER I trained most of my friends/family. I live in LA, which is a big market, but I was having trouble figuring out how to break into it and get myself out there. I'm going to play around with this advice and keep working on getting my lifts up with Paul in the meantime. This seems obvious to me but here it goes anyways: Can you talk to him about a possibility of an internship? You're strong enough to start working with novice members of the general public. You aren't going to make any money training "elite lifters" anyways. You have to get comfortable "hard selling" yourself, but no need to use hyperbole or promise things you cannot deliver on. You are basically selling an improved quality of life via strength training, not a promise to rewrite the record books or land on the cover of Muscle & Fitness. Selling yourself is hard at first because in the back of the mind you are filled with all kinds of self-doubt and you are painfully aware of all your own shortcomings, etc. But if you wanna start coaching people seriously it's hard to just kinda put your toe in the water. You sort of have to jump in with both feet and be all in. You'll make plenty of mistakes, you'll lose clients, etc. But just stay after it and you'll get better, your client base will get more stable, and eventually you'll make more money.